Astrocytes (top) can take up glucose from the blood circulation through glucose transporters (GLUT1), a process that is enhanced upon glutamate release from neurons and glutamate binding to astrocyte-expressed glutamate transporters (GLT-1). Glycolysis breaks down glucose to pyruvate with the production of ATP and NADH. Alternatively, astrocytes can break down intracellular glucose, which is stored as glycogen. 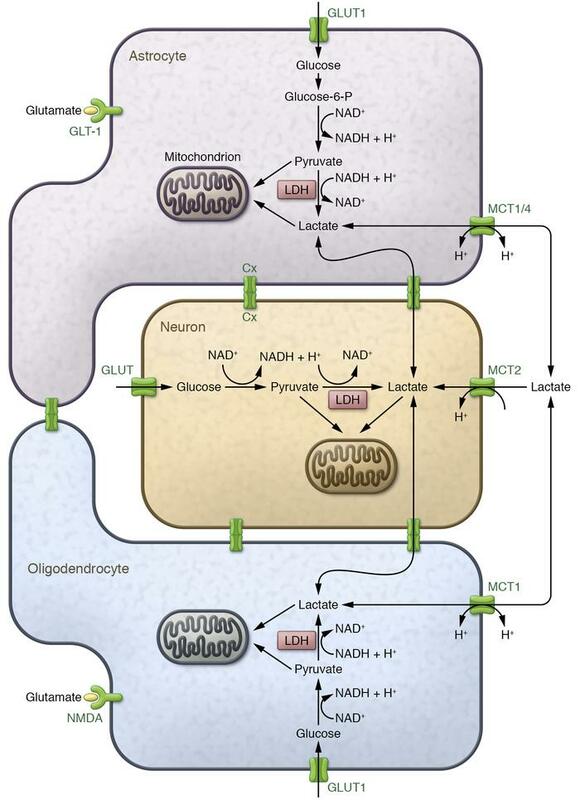 Subsequently, pyruvate is either metabolized in the mitochondria (leading to additional production of ATP) or converted to lactate by lactate dehydrogenase (LDH) when oxygen is limited (ensuring the continuation of glycolysis through oxidation of NADH to NAD+ to resupply the NAD+ pool). In oligodendrocytes (bottom), glucose can similarly be processed into pyruvate and lactate. Oligodendrocyte glucose uptake is controlled by glutamate binding to the NMDA receptor expressed on the oligodendrocyte surface. Intracellular lactate in astrocytes or oligodendrocytes can either exit the cell through the monocarboxylate transporters MCT1 and MCT4 or be converted back to pyruvate in the mitochondria, where it fuels ATP or fatty acid synthesis. Extracellular lactate can be shuttled to neurons through neuronal MCT2 and used to fuel neuronal ATP synthesis in the mitochondria. Gap junction coupling (Cx) between glial cells and glial cells/neurons mediates the exchange of metabolites like pyruvate and lactate, but the importance of these connections in metabolic shuttling is still to be further explored. Alternatively, it is hypothesized that extracellular lactate is imported in glial cells and could contribute to ATP synthesis in glial cells upon conversion to pyruvate in the mitochondria.